I’ve always been a fan of Swiss army knifes and multi tools using them for all sorts of jobs. The Switch is somwhere in between both and allows you to select the tool attachments you would like to carry.There are 18 in total ranging from your standard blades attachment to a 1GB USB Memory Stick. Using the supplied adapters you can add as main or few as you desire. Which are all held together using twisted end caps allowing you to hold either 2-6 tools in the small, 4-10 tools in the medium or 7-13 tools using the large. 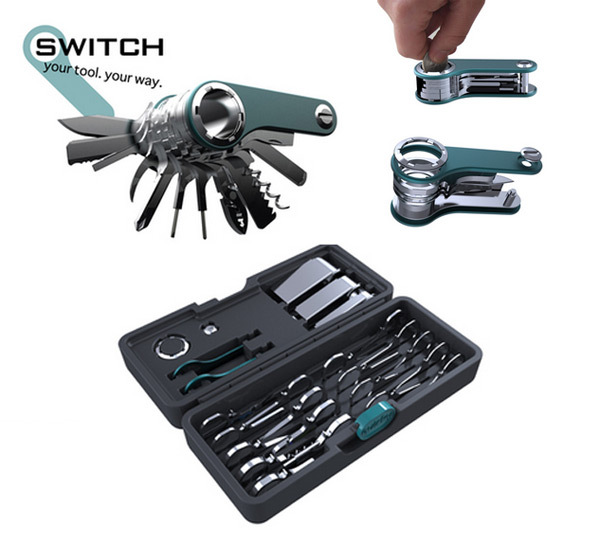 All 18 tool attachments include: Standard Knife, Pliers, Scissors, Nail File, Tweezers, Thin Flathead Screwdriver, Phillips-Head Screwdriver, Eyeglass Phillips-Head Screwdriver, Eyeglass Flathead Screwdriver, Wood Saw, Serrated Blade, Corkscrew, Combination Bottle Opener/Flathead Screwdriver, Combination Can Opener/Wire Stripper, Pen, Magnifying Glass, LED Flashlight, 1GB USB Memory Stick. Switch is currently available to pre-order from the Quirky website for $68.